The newest Fuji camera on the market is the Fuji X-T2 mirrorless camera. It’s been available for a couple months now so there are a few reviews and tests out there already. I personally own and use the X-T1, so I am very interested to hear about its successor. 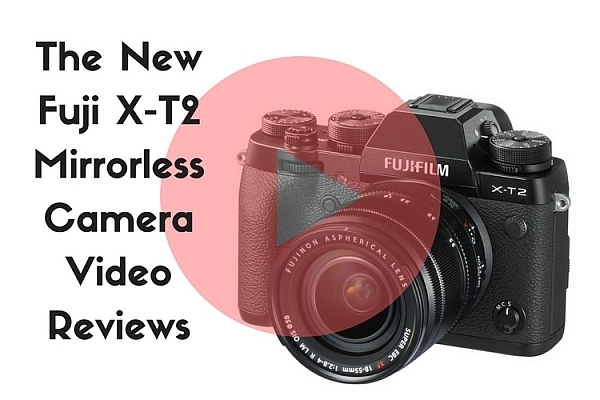 Let’s see what a few sources have to say about the X-T2. Check prices on the Fuji X-T2 on Amazon.com or B&H Photo. Tony and Chelsea tested out the X-T1 so they have a good comparison between it and the new Fuji X-T2 and talk about what’s new and improved in this video. They also mention a few things they would have liked to see added that weren’t. That the camera gets quite warm on hot days. I have noticed that with the X-T1 also. Using the Smartphone app that you can’t see the RAW images. How I get around this with my X-T1 is that I process a few select images into JPG on the camera then pull them to my phone or iPad to play with in Snapseed. I haven’t found it an issue. But overall she gives it a pretty good thumbs up and says she’s considering switching from Canon to use this camera for all her profession work. So that’s a pretty good endorsement. In this next video, the guys from the Camera Store give the Fuji X-T2 a good field test in New York City. They test both still and video which some of the other reviews don’t cover. Also mentioned in this video is the new Fuji speedlight which can handle high-speed sync. The highly improve autofocus on the Fuji X-T2 is mentioned and that it’s a bit tricky to set up. There’s a link to the Fuji Guys channel where they’ll help you configure it if you decide to pick up this camera or already have. YAY, you can open the battery compartment now without having to remove the tripod insert!! This is my biggest pet peeve of the X-T1. The dial on top lock and unlock and they move a lot smoother now. Mine on the X-T1 stick and something both the top and bottom ones move together. I know I can send it back to get those fixed but I don’t want to be without the camera for several weeks so I put up with it. Improved autofocus options and faster autofocus. From what I’ve seen the X-T2 is WAY better than the first generation X-T1. According to The Camera Store guys it actually rivals the Sony a6300 for fastest focus on the market currently. Impressive!! Two memory card slots. I like the idea of shooting RAW on one and JPGS using the nice Fuji film profiles on the other. Have you already ordered yours? Are you considering it? Have you had a chance to test drive one? I want to know. Tell me your thoughts in the comments below. The post Overview and Hands-On Reviews of the New Fuji X-T2 Mirrorless Camera by Darlene Hildebrandt appeared first on Digital Photography School.